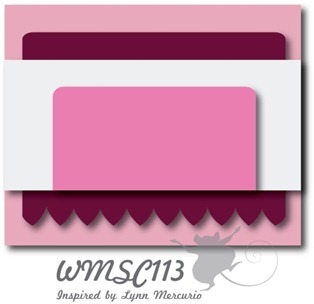 I love seeing the titles in your blog posts...always gets me singing and your card is gorgeous! Yummy! Love the colors and totally needed a Beetles tune stuck in my head for the rest of the day! LOL Waving hi!!! 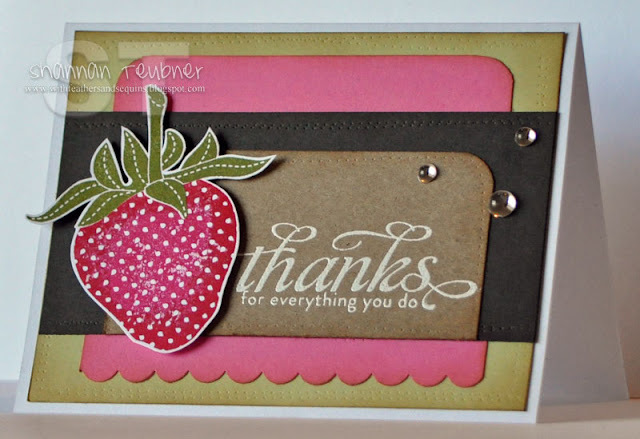 Thanks for playing along with the Waltzingmouse Stamps Sketch Challenge this week! Deee-liciously good, Shannan! I need to get a tracing wheel because 1) I can't sew and 2) the look is SO FAB! The subtle colors in the background make that big berry just SHINE! So glad you could play along with the WMSC this week! Simply fabulous! I love the simplicity of the design and gorgeous looking berry! Great card! I think I'm going to need some!! Beautiful clean card. Your berry looks amazing and I love the colors you chose! Shannon, this card is so sweet! That shade of red ink is so pretty on the strawberry. Who makes that ink color? I must have it! And the embossing on your card...love it! So glad you joined us this week at Waltzingmouse! What a treat! Love the card you made for last weeks sketch! Congrats !Perfect amount of bling as well. This card is Fabulous!!! love the colors you chose too!